It's all about me: One, Two, Theme! We're hosting a challenge! It seems that Alex and I are announcing too much at once, but we couldn't wait any longer with this fun project. We've been talking about reading by themes, to get into subject areas, find out more about certain things. We wanted to finally do what we always say when we read an interesting book - 'I must read up on that sometime'. Well, 'sometime' has arrived and we decided to welcome it warmly and stuff it into a challenge format. We set up a separate blog where you can sign up and read about the challenge and eventually, hopefully look at all the themes that bloggers are exploring. Unless no one signs up. I noticed that the tendency in the blogosphere is going towards themes anyway though (see Eva's thoughtful post) so hopefully people WILL sign up. The idea is to identify subjects that you want to know more about, then rank them in some way to show that you want to go more in depth on some and less so on others. So for theme one you'd read one book, for theme two, two books and so on. 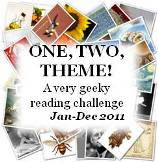 From theme 2 onwards you need to read at least one fiction and one non-fiction. We're very excited about this. :-) If you want to focus and organise your reading next year, join us here! Here are the themes that I'll be exploring, along with some book ideas. I might add some or change some, who knows, but this is what I'm starting with. Let me know if there's something you think I should add! I have no idea of how I'll rank the themes, I'm leaving that bit open! Naguib Mahfouz has a trio of novellas set in Ancient Egypt. I've read the first one and enjoyed it! Weren't you saying that you Mort by Pratchett in your TBR? We can read it together. I'll think of others as we go along! PS: I have Crocodile in the Sandbank in audiobook if you want it. Good fun! Eva - I've come across that trio and wondered about it, thanks! And I'm totally looking forward to the lists too, I hope that we'll have some takers! Alex - Let the Great World Spin is already on there, I didn't think of adding Mists of Avalon but now will and I have Crocodile on my shelf, so no thanks! Jenn - You know what? I don't want to wait either, let's start now then! Yay!